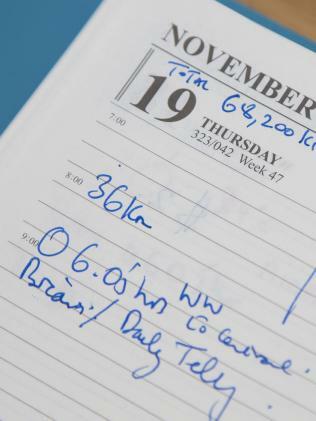 Fresh from his hour-long commute, squeezed in with thousands of Sydneysiders, Howard Collins plonks himself down at his desk, pulls out a diary heaving with appointments, and finds a little space to write down a number. Today it’s 68,200. The number will grow before his head hits the pillow. It’s his secret weapon, an indication of how personally he takes his formidable job, and emblematic of his unpretentious style of leadership. 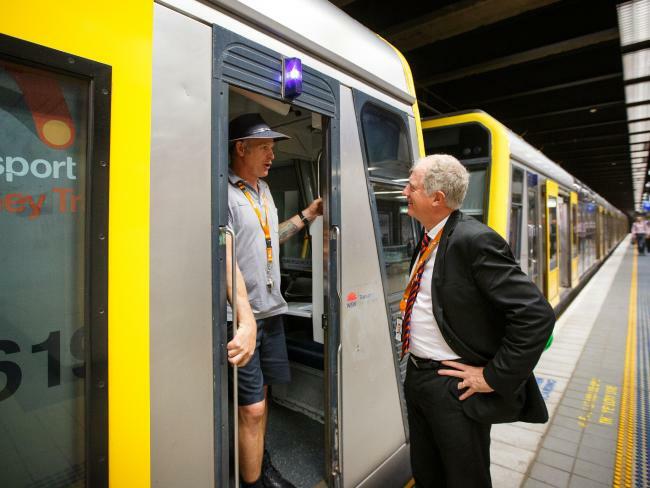 The 68,200 are the kilometres of travel he has done on Sydney’s rail network since being lured from the plush job of running the London Underground to be chief executive of Sydney Trains a little over two years ago – the near-equivalent of two full loops around the globe. Howard has been clocking the numbers and ticking off the 178 stations, one by one, until the station map on his wall is full of red crosses. That distance buys you some street cred. It gives you empathy and unparalleled insight into the machinations of the business from the coalface. It cheers your workers and, apparently, wins you friends. And that guy at the end of the platform? Rain hail or shine “he always wears his shorts. But then again, he is from Scotland. Lovely guy”. Collins is pointing out his fellow commuters — the clutch of Shire folk he shares his mornings and evenings with, all now facing south across the railway tracks, heads bowed over smart phones, awaiting the 6.05am to Central. His fellow commuters, and his customers. This is his idea of pressing the flesh — just being a normal passenger on the vast network he runs, shunning the chauffeur-driven car that would be his right and riding his Dutch-made bike to the station, strapping his green helmet to his backpack and using his commute as an opportunity. He is not seeking to be an anonymous observer, to spy on his staff, but a six-foot tall walking, talking complaints hotline, evident by the large name tag proudly pinned to his chest. 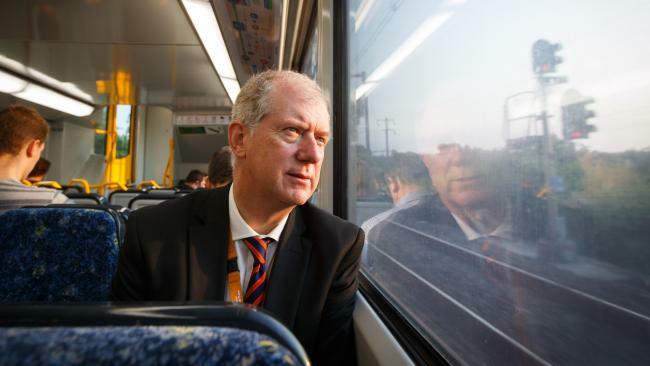 Chief Executive, Sydney Trains. By the time the 6.05am drags itself into Central, three passengers have taken an opportunity to talk to the boss with a mix of praise (“the trains have never looked so clean”) and queries (“why does this train wait an extra minute at Sutherland?”). “The vast majority of people say that things have gotten better and that the place looks clean. Occasionally they will talk about a specific delay they experienced,’’ he tells The Saturday Telegraph. Some days require him to delve into his backpack, digging around for his high-vis jacket to help clean up a platform spill or attend to an incident well below his pay grade, or to fill his ever-present garbage bag with stray rubbish. He carries two every day. Last month while attending an event in North Sydney, the boss heard a train seat had been “decorated” with syringes. So he donned the gloves and helped pull 100 needles out of the seat. 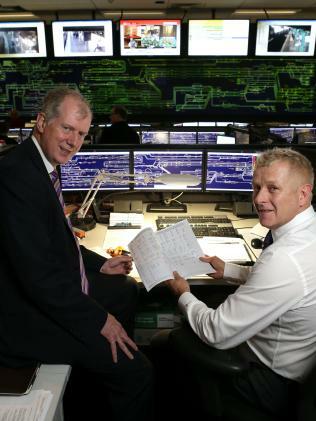 Howard Collins in the rail management centre at Central station. Jottings from the diary Howard Collins keeps. Six months into the job, one of the train cleaners mentioned they never see anyone in management. So Collins jumped on a train to Campbelltown in the dead of night, and spent the early hours cleaning trains. 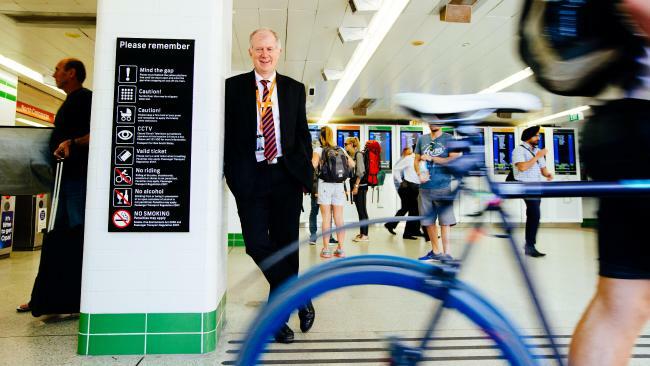 This style of humble leadership, perhaps a little foreign in the gung-ho corporate realm of Sydney, is all geared around a culture that Collins has sought to bring to Sydney Trains, a culture he learned in 35 years with London Underground, including his leadership through the 2005 London bombings. “We want to present the human side of the business, because we are public servants and that’s what we are trying to do,’’ he said. He points to his policy of having stations staffed with the same people. People such as Brian at Woolooware, now leaning on his trusty broom and chatting to his CEO like a pal. 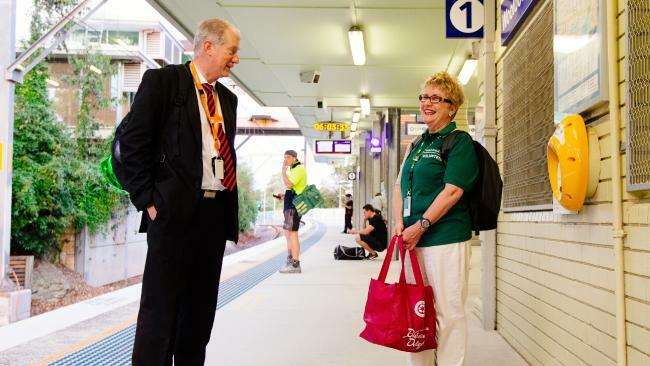 “He’s the chief executive of the Woolooware Train Station,’’ Collins says. But Collins also presents the human side of management. Collins stops talking to shake hands with the train driver who has just guided the train to Central. For the first time senior and pensioner customers can get a Gold Opal card on the spot at Opal kiosks located at 40 major train stations, bus interchanges, light rail stops and ferry wharves up until January 2016. 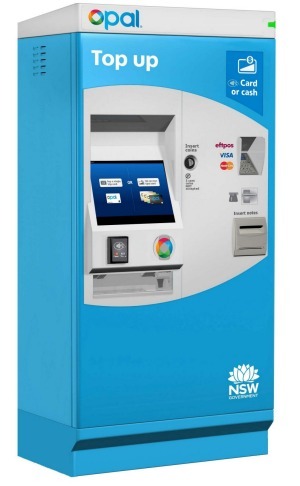 To apply for a Gold Opal card, seniors and pensioners do not need a credit card at the kiosk, just an eligibility card – NSW Seniors Card, Pensioner Concession card, or DVA NSW War Widow/ers card. “We’ve had about 200,000 pensioners and seniors signing up to the Gold Opal card since we announced the phasing out of most paper tickets three months ago,” Mr Constance said.